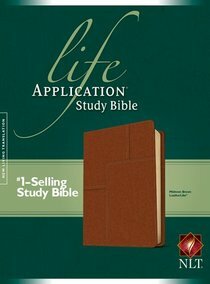 About "NLT Life Application Study Bible Midtown Brown (Red Letter Edition)"
:The Life Application Study Bible is today's #1?selling study Bible. The notes not only explain difficult passages and give information on Bible life and times but go a step further to show you how to ?take it personally,? speaking to every situation and circumstance of your life! This is the one Bible resource that incorporates today's top scholarship in answering your real-life questions. It includes nearly 10,000 Life Application notes and features designed to help readers apply God's truth to everyday life. Now available in a Midtown Brown design. The New Living Translation is an authoritative Bible translation rendered faithfully into today's English from the ancient texts by 90 leading Bible scholars. The NLT's scholarship and clarity breathe life into even the most difficult-to-understand Bible passages?but even more powerful are stories of how people's lives are changing as the words speak directly to their hearts. That's why we call it ?The Truth Made Clear. ?